The lecture will be the first presentation ever of Pedro&Juana in New York with a comprehensive introduction of their most recent work, that will dive into their process of thinking through design. Assemblies of different objects at all scales from pigs through pots to buildings tell the story of relationships between all the actors that interact with each other. Pedro&Juana is a studio from Mexico City founded by Ana Paula Ruiz Galindo and Mecky Reuss that works on a variety of projects across creative professions. Pedro&Juana explore the capacity of objects to change their environment, through the indiscriminate use of material, texture, color, placement or form. Their projects assemble new and unexpected relationships with those that encounter them. Some of them are: Sesiones Puerquito or Little Pig (2012-2014), cooking a suckling as a pretext for better conversation. 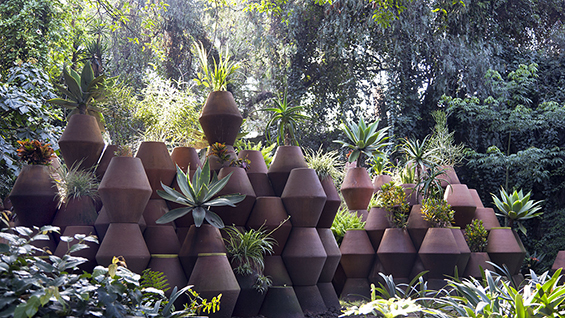 Archivo Pavilion (2012), an intervention in the gardens of Archivo Diseño y Arquitectura DF/Mexico. Hellmut (2013) a Table turn Bench turn Table for Gallery 1 of Museo Jumex DF/Mexico. Casa Reyes (2011- 2012) an annex in an ex-colonial house in Merida/Yucatan. Pavilion of Hotel Palenque is not in Yucatán, a de-differentiated structure at the Hessel Museum of Art, NY (2014). With Love from The Tropics (2016-2017) a hanging garden for the MCA in Chicago/US. This event is open to current Cooper Union students, faculty, and staff. Members of the public may RSVP specifying the event title. Room 315F.